The Technic Pawn Pincher is a Tactical weapon. With all of the gizmos, gadgets and mechanical gewgaws placed on the field by the Technic Team, one more coal engine isn't going to arouse much notice. In fact, this trap fits in so seamlessly with the Technic defensive line that Technic Pawns try to check it for repairs on a regular basis. When they do, the claw picks them up, and either flings them away, or drops them in the engine for three free hours of running time. Efficiency at its best! 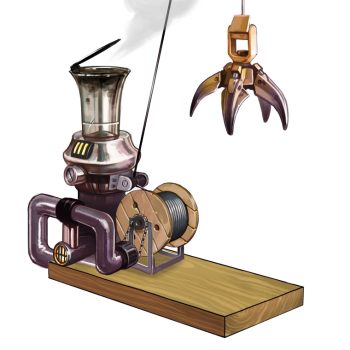 The Technic Pawn Pincher can be purchased for 643,750 gold from the Seasonal Garden Trapsmith. It refunds for 77,250 gold at the same location. The Technic Pawn Pincher is a special-purpose weapon designed to catch the Technic Pawn in Zugzwang's Tower while avoiding the Mystic Pawn. Mystic Pawn Pincher - Designed to catch the Mystic Pawn in Zugzwang's Tower while avoiding the Technic Pawn. Blackstone Pass Trap - Increased effectiveness against Mystic mice in Zugzwang's Tower. Obvious Ambush Trap - Increased effectiveness against Technic mice in Zugzwang's Tower. 26 August 2010: The Technic Pawn Pincher was released with the introduction of Zugzwang's Tower. This page was last edited on 13 January 2019, at 15:52.